“Europe – Our History” is a textbook series, planned to encompass four volumes, for day-to-day use in the history classroom at the first stage of secondary education. Its intent is to provide learners with up-to-date and new ways of accessing history. The text, materials and student tasks contained in the series’ volumes are structured and presented with the aim of increasing learners’ motivation and relating to their experience. They cover the history curriculum for the appropriate stage of education while enabling learners to acquire skills in historical knowledge (substantive competency) and methods (methodological competence), the forming of judgements (evaluation competence), and in how to engage in a constructive dialogue on the plurality of historical experiences (action competence). its open concept of history: its aim is to help students understand history as a process in which the research questions, interests and the available information are subject to change over time. its multi-perspective approach: the sources included in the books have been chosen to reflect past historical events from a range of viewpoints. its encouragement of engagement with differing interpretations and points of view: the text in the volumes and the interpretations offered by historians are designed to make students think about the issues and enable them to form alternative points of view. its refusal to overwhelm learners with pre-formed judgements or an “information overload”: the book seeks to enable students to form their own views and assessments of historical events. One of the central features of the book series is the incorporation of changes of perspective as an integral element of its structure; this approach emancipates history and learners from nation state-centred points of view, raises the question of history’s role in the formation of identities, and makes visible to learners the plural nature of Europe’s cultures of memory. This structure encourages learners to develop empathy for perspectives other than their own, arrive at their own judgements and give their reasoning, and engage constructively with diversity. In this way, “Europe – Our History” seeks to enable young people to enter into dialogue with history and with one another and thus to contribute to greater mutual understanding in Europe. One of the key elements of the series, which has enabled it to meet the highest standards in terms of content and of its educational approach, is the nature of its development as a process involving multiple stages and a Polish-German tandem team including the series’ two publishers, educators working on the ground, and academics in both countries. 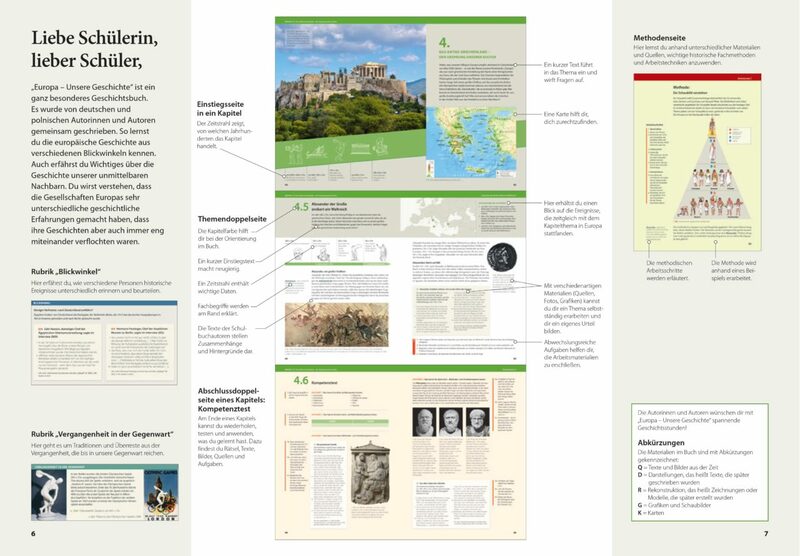 The large number of historical reconstructions the book contains, which make history come alive for young learners in an appealing and easy-to-understand way, represent a method rarely seen on the German textbook market. Double-page ‘launchpads’ act as introductions to each chapter, providing an accessible overview of the topics covered and setting out key questions. The main and sub-chapters contain ‘lead texts’ whose intent is to encourage learners to develop hypotheses; text by the volume’s authors whose purpose is to present the topic at hand in an age-appropriate way in language students can understand; a range of materials for varied and inspiring work on the topic, such as textual and visual sources, maps and reconstructions; and action-centred student tasks, pitched at various levels of challenge, to encourage students to work independently and learn through discovery. ‘Focus on methods’ pages use a range of types of source to help learners acquire techniques and methods used by historians in their work and inspire them to develop a critical awareness of history. There are competency tests at the end of each chapter to check learners’ progress and help them train their newly established subject knowledge, methodological competencies, judgement and action-oriented abilities. Point of View: this feature presents differing views from historians on an issue to encourage learners to engage with controversial interpretations of historical events. Past in the Present: shows sites of memory (lieux de mémoire) and elements of cultures of memory in Germany and Poland. Meanwhile, elsewhere in Europe…: serves to contextualise the topic or issue in European history and points students to historical events taking place at the same time as others discussed in the book.